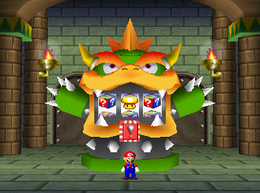 Bowser Slots (stylized as BOWSER Slots) is an item minigame found in Bowser Land in Mario Party 2. To earn an item, the player has to match three pictures of the desired item by stopping each reel. If the player successfully matches three of an item, it will pop out of the slot's head, and the player wins the item; however, if they don't, a spring with Bowser's head on it will pop out of the slot's head and bounce back and forth until the game fades out; thus, the player gets nothing. Game Rules – "It takes well-timed jumps to line up 3 of a kind. Match them up to win!" Advice – "There are always 2 of one kind in a row on each block. Watch closely when jumping. You miss if you don't get 3." This page was last edited on January 29, 2019, at 21:49.